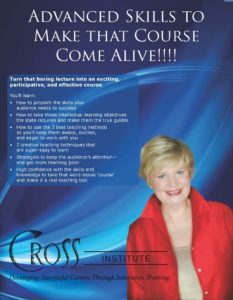 In a month from now, I’ll be doing a training on how to make your courses come alive. Why? Because, unfortunately, most real estate courses consist of someone at the front of the room droning on…..and on….and on. Now, I don’t think that’s the instructor’s fault, to an extent. I think it’s the fault of the course writer. Does your course come with an instructor guide? Does it tell you HOW to teach that particular page? Or, like most courses, is it actually a little (or sometimes big) book on factoids? You innocently pick up the course outline (it’s big and heavy, of course), and you start talking. How long does it take for your audience to quit listening and play with their phones? 3 minutes? 10 minutes? Probably no longer than that. In truth, our attention spans have shrunken–and continue to shrink. So, we instructors just can’t talk through that outline and expect to keep the audience’s attention. But, what do we do instead? In this series of blogs, I’ll show you how to take part of that outline and make it more interesting. Since few courses have these teaching methods written in, you’ll have to develop the skills to take that boring outline and put in various and varied teaching methods. Find out how to do that in my upcoming course: Beyond the Basics: Advanced Skills to Make that Course Come Alive, coming up April 23-24 (approved for 7.5 clock hours in Washington state). One of the reasons our real estate audiences get antsy is that they don’t like to sit quietly. But, you’ve probably seen the room get out of control if you encourage wild, unabated discussion! So, how do you help them talk and still control the situation? Divide and Conquer. Instead of having them all talk in open discussion, use the small group method. That’s called ‘task force’, because you’re literally putting them into small groups to work on a task they can accomplish. Here’s an example of how to take the facts in that outline and throw them to the audience to reveal. Think of it this way: Instead of you–standing up in front of everyone and telling, and telling, and telling, you ask small groups to tackle parts of your topic and come up with solutions. I teach Instructor Development Workshop, (coming April 9-10 in Bellevue, Wa), which certifies instructors in the state of Washinton to teach clock-hour approved courses. In one part of the outline, the topic is How Adults Learn. I have 3 pages in that outline that innumerate all the ways adults learn, including obstacles to adult learning. Your turn: If I were to give you that outline and ask you to teach it, how would you proceed? You might just talk through those 3 pages, reading what I’d written. Hate to tell you, but that would be so boring! (And you wouldn’t learn what your audience does and does not know!) Instead, here’s how I do it. Here’s how I teach this section. 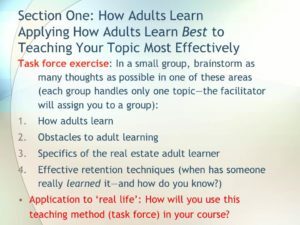 I divide that topic into 4 areas: How adults learn, the obstacles to adult learning, the attributes of the real estate adult learner, and effective retention techniques. See the slide from my Insructor Development Workshop I use that gives instructions to the task forces here. Look at the last sentence in the slide. That’s my ‘springboard’. I’m asking the attendees to figure out ‘what does it mean to me?” That’s the relevance of the exercise. In later blogs, I’ll give you tips on using this and other ‘divide and conquer’ methods to make your teaching–and their learning–much more enjoyable! You’ll get great reviews and return customers! There are 2 ways I can help you: If you’re in Washington state, come to my class April 23-24. Or, invite me to your company anywhere in the US or Canada and I’ll customize a special session for you. I use YOUR outlines and we actually put in the methods and teach them. You’ll get much better attendance at your courses, have excited, enthusiastic instructors, and find it easier to get return business! Contact me to find out how I can help. Let’s make your courses shine!